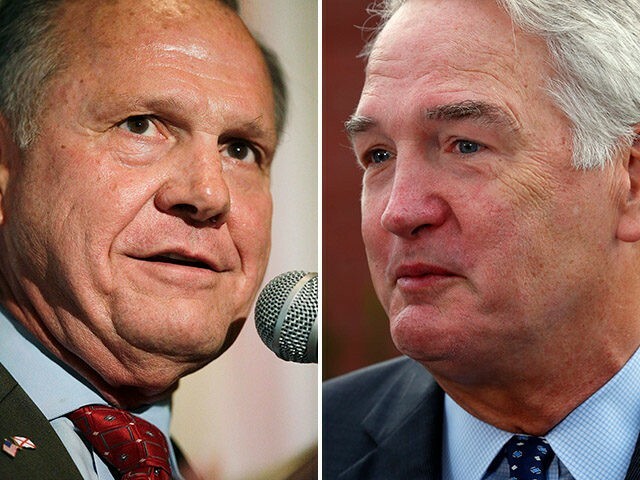 6 Sep 2017 Washington, D.C.
Judge Roy Moore is the clear conservative frontrunner for the U.S. Senate GOP primary runoff on September 26, dwarfing the GOP establishment-backed Sen. Luther Strange by more than double digits in a new poll. Moore towers over Strange with a solid majority of the electorate and a 16-point lead. Moore’s 52 percent, per the new poll, dwarfs Strange’s 36 percent in the poll conducted by firm Southeast Research from August 29 to August 31 in Alabama. The poll surveyed 401 likely voters in the runoff and has a margin of error of five percent. Dr. Ingram has conducted hundreds of polls in the state of Alabama for races involving the U.S. Senate, U.S. Congress as well as state races for Governor, Attorney General, the Alabama Supreme Court and other offices. He is certified by a national professional research organization at their highest level and he has been recognized as an expert in public opinion research by both federal and state courts. This is the third poll in as many weeks that demonstrates how Moore is leading Strange significantly, while Strange struggles to gain any traction whatsoever. Moore’s campaign, since the first round of voting on August 15, has been consistently picking up conservative and GOP support with key endorsements and gaining momentum. Strange, meanwhile, is struggling to get anywhere with his campaign as his highest-profile endorser, President Donald Trump, who backed him in the first round but not in the second round, appears to be backing off his support for Strange. Strange has been complaining about the polls, but continuing to complain will not likely help him win. His campaign actually drafted a memo whining about the polls—and leaked it to establishment-friendly reporters so they would put it in the press—as part of a desperate effort to shrug off the fact that his campaign is losing badly despite the millions upon millions of dollars the establishment in Washington, DC, is spending on his behalf. The poll shows Moore’s strength is with evangelicals and conservatives, while Strange is only getting support from “moderate” voters. Fifty-four percent of evangelicals and 58 percent of conservatives back Moore, while Strange only gets 32 percent of each. With moderates, Strange gets 49 percent and Moore gets 39 percent, while non-evangelical Christians back Strange with 55 percent, and 40 percent back Moore. Ingram has polled for the campaigns of Sen. Richard Shelby (R-AL) in the past and maintains a close relationship with Alabama’s senior senator. He is widely respected in the state of Alabama. Strange has attempted to present himself in the race as someone who is supportive of the president and his policies, but nothing could be further from the truth. Strange, until Tuesday, campaigned aggressively on opposing changing U.S. Senate filibuster rules that require 60 votes to pass legislation. He had signed a letter to Senate Majority Leader Mitch McConnell and Senate Minority Leader Chuck Schumer expressing his opposition to changing the rules, and he pushed a very public defense of the filibuster during the campaign. Strange was in direct opposition to President Trump on this matter, as the president has called for the Senate to eliminate the filibuster rule, and Moore has been supportive of the president’s call to change the rules. Then, on Tuesday of this week, Strange demonstrated his weakness by flip-flopping against the filibuster—and holding a press conference withdrawing his signature from that letter to McConnell and Schumer. But it appears the damage has already been done, as voters recognize Strange as someone who first and foremost stands up for the Washington establishment. Meanwhile, Moore has emerged as a much stronger candidate on the issue of immigration. On Tuesday, Moore publicly backed the RAISE Act from Sens. Tom Cotton (R-AR) and David Perdue (R-GA). The president supports the RAISE Act too. This means not only securing our borders to stop illegal immigration, but also rethinking our approach to legal immigration. I am proud to join President Trump, along with Senators Cotton and Perdue, in supporting the RAISE Act. When I am sworn in as the next Senator from Alabama, I will be signing the RAISE Act as a cosponsor. I support the RAISE Act because it creates a modern, smarter immigration system, while protecting Americans who are struggling to make ends meet and ensuring that nuclear families remain intact. Decades of failed immigration policies that allow low-skill and unskilled labor into our nation have depressed wages for American workers. These failed policies do not meet the needs of our economy, and this proposal will correct that by establishing a system that spurs economic growth, creates jobs and raises working wages. The RAISE Act wisely recognizes that instead of handing out visas through fraud-ridden, random lotteries, the United States should reduce the amount of immigrants admitted annually and prioritize those with the skills and education to make a contribution to our economy. This proposal is an important step, leading our country away from its outdated and uncompetitive immigration system, towards a modernized, merit-based system to place a greater emphasis on skills-based migration. A focus on skills is long overdue and will greatly benefit American workers and our economy. Strange, meanwhile, opposes the president on the RAISE Act. He has had months to cosponsor the bill and has refused. Strange’s campaign refuses to make the senator available for an interview on matters like these, so he cannot publicly explain his deepening opposition to President Trump and his policies.